The flea-sized Issus planthopper insect has made mainstream news, not because it jumps about a meter (3 feet), some 300 times its length, or because it jumps every day with astounding speed, at an acceleration of 200 Gs (the human record is a momentary 46 G acceleration). It's in the news because it's an example of nature having first "invented" what we thought was a man-made technology: interlocking gears. the back legs of a planthopper insect. Yes, it has toothed gears at the base of each of its hind legs that mesh and rotate together, like mechanical gears, which almost completely synchronizes the motion of the 2 legs to produce a stronger, faster jump in the right direction. With their leg gears intermeshed, when one leg begins to jump, the other follows immediately, faster than a nerve impulse can reach an individual leg muscle and with coordinated force that propels the animal from one plant to another, and away from danger. 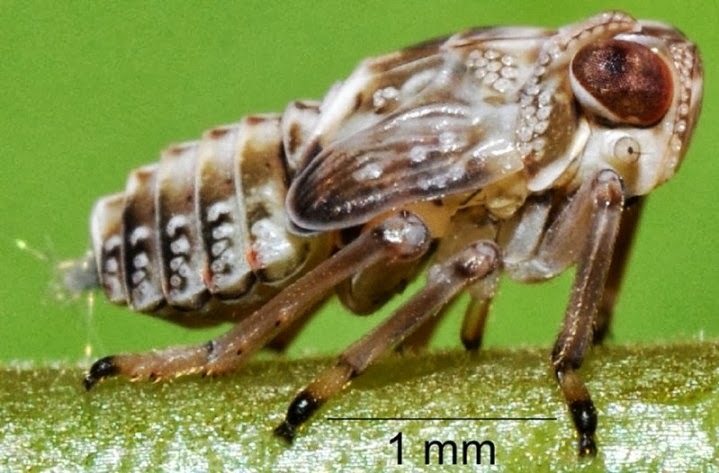 Here is the Issus planthopper, a.k.a. leafhopper, as you mind find him/her in your yard (if you have sharp eyes). Click here for some larger images, plus videos of this super-jumper under the microscope. This species can't fly, so a hyper-efficient jump that launches the planthopper as far away as possible and in the right direction is key to its survival. 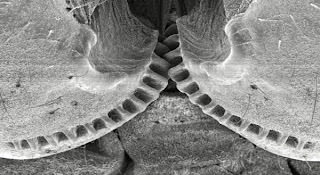 In fact, 20 families of planthoppers have these gear structures, yet only the nymphs (the adolescents) have gears - perhaps this is when these guys need maximum spring? As they mature, insects go through several stages (called molts) during which the whole skeleton is replaced. 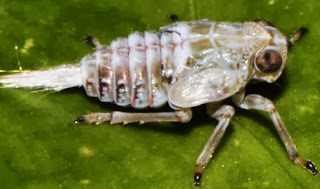 During the planthopper's final molt, it loses the gear structure and gains a new mechanism that uses friction between parts of its legs to synchronize and trigger its jumps. Perhaps the bigger, stronger adults can jump fast and far enough without the gear structure? Yet why would they lose the gear mechanism that was successful enough to get them that far? Perhaps it takes energy to maintain the gear mechanism, energy that could be used for jumping and other actions, once the animal has experience and legs strong enough to escape predators? Or perhaps the gears wear out. 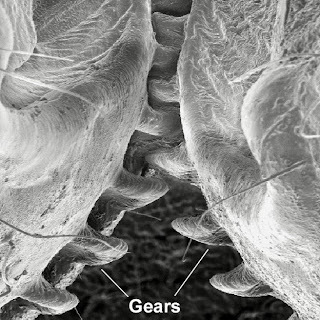 The researchers believe that the risk of breaking a gear tooth is high, so once it completes its last molt, the insect loses the chance to repair the teeth. "If you break your gear wheel a day after you molt, you'll have to live with a broken gear wheel for the rest of your life," lead author Malcolm Burrows explained. And that life would probably be pretty short, he added, since the insect wouldn't be able to effectively jump away from predators. Result: no survival → no reproduction → very poor fitness! We can give our species a round of applause, actually, for both successfully creating a mechanical structure that is as successful as the one created by nature and for discovering it in the tiniest of creatures. Each gear tooth on the planthopper's legs is thinner than the width of a hair, and it took some creative research, involving placing the planthoppers on their backs, tickling them with a paintbrush to make them kick, and filming the action with high-speed cameras, to find them!